The whole point of joining a Homegroup is sharing – giving and receiving access to your friends pictures, libraries or printers. This page will help you create and troubleshoot Windows 8 Homegroups. My initial reaction to Homegroup was frustration. While years of configuring Microsoft desktops meant that I could setup Workgroups on auto-pilot, creating and joining a Homegroup seemed like learning a foreign language. My conclusion: this is a rare case of the less you know in advance, the easier it is to setup a Windows 8 Homegroup. 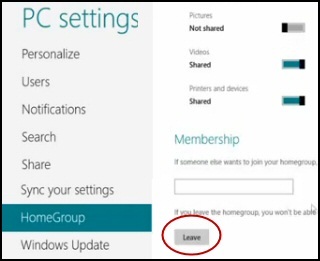 Remember that only Windows 8 and Windows 7 machines have the ability to join a Homegroup. Vista and older Microsoft operating systems can connect to a Window 8 machine, but only through Workgroup settings, which require a separate configuration setting in the System section of your Control Panel. Imagine the scenario: it's a home network with one Windows 8 tablet and two Windows 7 desktops. One user needs to take charge; they need to create, or initialize, the Homegroup. The practicalities are straightforward just navigate to the Network and Sharing section of the Control Panel. Crucial point: Write down, or copy and paste the password, because the other machines need it to join the Homegroup. Incidentally, this is fundamentally different from a Workgroup where no passwords are involved at this stage. Once the leader creates the Homegroup, the other users fire up their Control Panels, navigate to the Network and Internet folder and join the Homegroup using the password from the first computer. Any problem, go back to the Control Panel on the original machine, and get a copy of the password. To configure who can see one of your folders, right-click and select ‘Share with’; then select your option, Read / Write or Specific people, see screenshot to the right. Perhaps a better way, at least to begin with is tick boxes in the homegroup settings in the Control Panel, see below. My ‘ah-ha’ moment was realizing that each user account on each computer is potentially a member of the Homegroup. To my way of thinking this was a different philosophy from a domain or workgroup where an administrator does the sharing for all the users of a machine. What threw me into confusion was that in a Workgroup each machine joins once, and any shares affect all users of that machine. Whereas in a Homegroup each user is in charge of their own shares. So it’s a personal responsibility to decide which personal folders, or ‘Libraries’ to share; a tick in the box means a resource is available for other Windows 8 users in the Homegroup to view. This new Homegroup logic of sharing is apparent when you launch the Explorer, once you find and expand the Homegroup you see the icons representing users shares rather than being machine centric. Incidentally, unlike a Workgroup there is no ten-user restriction on the size of a Homegroup. This worked seamlessly for me. I copied the password from my Windows 7 machine (Control Panel, Network, Homegroup), pasted into my Windows 8 Homegroup. Then I shared out my Music and Documents. It was a thrill and a relief that they appeared on my Windows 7 machine Homegroup. I could also see the reverse, the Windows 7 Homegroup members on my Windows 8 machines. Since the vehicle for this sharing is the local network rather than the internet, there is less need for stringent security. In my opinion you have to start with degree of trust and respect, or else there is no point in creating a Homegroup. For instance, if you know the passwords of the other users in the house; you could logon locally. That is not to say you should ignore security, but more to suggest that you set permissions to control accidental over-write or delete errors. After all, a determined local user could just gain physical access to any machine in the house. Each Workgroup can be given a distinctive name, however, the singular name Homegroup is hard-coded, therefore, please avoid overthink and don’t worry about changing it to a special name. Another important principle is it’s up to each individual to go through the Control Panel configuration procedure before their Pictures, Music and Libraries are visible in the Homegroup. Because of Windows 8’s auto-detect ability, all they need is to get the Homegroup password from the first computer. As for viewing other people’s shared folders, launch Windows Explorer and seek out the Homegroup folder, which is just above the Computer and Network icons. On the screenshot you can see that Guy and Pauline have joined the Homegroup on the Jasmine Windows 7 machine. Troubleshooting Windows 8 Homegroup problems falls into three categories, Newbie errors, configuration mistakes and bizarre stuff. Forgotten the password? Type Homegroup in the Search dialog box. Select: ‘View or print the homegroup password’. 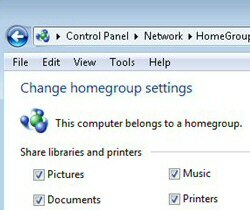 Homegroups only works if you have Windows 7 or later operating system, sadly for Vista you would need a Workgroup. Curiously, you need a second user to see Homegroup working, in reality you also need to setup Homegroup on a second machine. You cannot setup a Windows Homegroup with either Windows 8 Starter, or Home Basic. Yet bizarrely, these cheaper editions can join an existing Homegroup created in Home Premium or Ultimate. 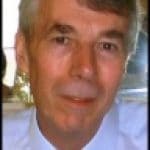 Another restriction is that while Windows 8 computers that are part of a domain can join a Homegroup they cannot share their printers or folders. What this means in practice is that if you take a domain-joined laptop home, it can join the Homegroup, the benefit being you can now access files on your home computer, however, other no home computers can access shared (company) folders on the laptop. Homegroup will only work if you configure the computer’s current location to be: Private network. Check in the Control Panel, Network and Sharing Center that the active network is not 'Unidentified' or 'Public network', but 'Private network' see screenshot. You cannot setup more than one Homegroup per subnet. Thus if you needed to subdivide the computers you need to configure different IP Addresses e.g. 192.168.1.x. And then 192.1.168.2.x. Synchronize the computer clocks. Networking problems seem to mushroom when computers timings are out of synchrony. Homegroup is one technology that relies on computers’ time to be in step. Wireless networks are notorious for intermittent errors, see if an Ethernet wired connection solves this Homegroup problem. See more on Windows 8 Network Locations. If you still cannot get your Windows 8 Homegroup working, check the ‘Advanced settings for sharing’. To do this navigate to the usual Control Panel, Network, Homegroup folder. Next scroll down to ‘Other Homegroup actions’, now click on ‘Change advanced sharing settings’. As you examine the radio buttons make sure that Public folder sharing is turned on. Add a DWORD, DisabledComponents with a value 0xffffffff, this disables all IPv6 components. Restart the computer now edit 0xffffffff to 0. This enables IPv6. Error code 0x80630801 Windows cannot set up a homegroup on this computer. Troubleshoot the Homegroup Service, they begin with 'Peer'. Specifically, see what happens when you try to restart 'Peer Networking Grouping'. Now delete a file called: idstore.sst (The extension may be hidden). Investigate Group Policy problems. Either with Windows 8 gpedit.msc or the little brother, secpol.msc. For more intractable problems call for the Homegroup troubleshooter, which can piggy-back the network trouble-shooters if required. If that fails then search, or post your scenario in a good forum such as TechNet Windows forum. Scenario: Mr Somebody joined your Windows 8 tablet to a Homegroup. However, Mr Nobody likes this homegroup, and you wish to leave. Call for the Charms; hover the mouse over the top right of the main screen. Homegroup is the next to last item on the menu. At the very bottom of the right pane you will see a grey 'Leave' button. Plan B: Navigate to the Control Panel. Original research by Paul DeBrino on a Windows 7 Homegroup. Tested by Guy Thomas on Windows 8 Homegroup. After many frustrating hours of trying to get Windows HomeGroup to work as desired, I have abandoned it altogether and, hence, disabled HomeGroup on all computers in my household. 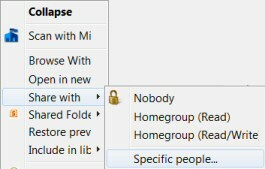 In conclusion, it's my opinion that HomeGroup is a "black & white" feature, severely limited by two sharing options: FULL or READ-ONLY for ALL user accounts, across ALL computers in the HomeGroup. Consequently, in a household where one wishes to provide granular / limited sharing, HomeGroup is NOT the solution. I adopted the following solution which, for me, was rather simple and effective, achieving the desired results. In my home, there are several computers. "SOURCE" refers to our central computer where "X:\top-folder-to-share" resides. "CLIENT" refers to all other computers in my home. I desired to share the aforementioned folder with family members, as well as with myself, while logged into any CLIENT. Neither SOURCE nor CLIENT are part of a HomeGroup. Each family member's account (including my own) is defined locally at SOURCE and is configured as a "limited" account. At any given CLIENT, the owning family member's account is defined and configured as "limited". To clarify, not every family member's account is defined on every CLIENT. 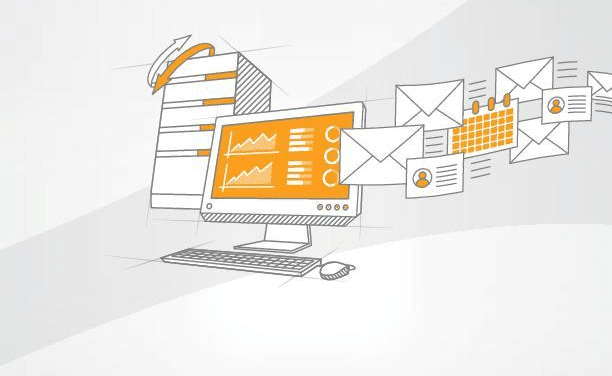 All computers (SOURCE, CLIENTS) have UAC fully engaged and the built-in administrator account has been renamed consistently across all computers, allowing the admin to have full access to all systems from any CLIENT. On SOURCE, I created "limited" accounts (Spouse, Child) and assigned the same Username and Password as they use at their own CLIENT. Next, on SOURCE’s folders that I wished to share, I enabled Sharing and (under Advanced Sharing) set the Share Permissions to "Authenticated Users" and "Administrators" (the latter as a standard, even though redundant), and also removed "Everyone" as a standard practice. Next, for each of the Shared folders on SOURCE, I set the rights / permissions / folder ACLs to reference the local accounts (Spouse, Child) and assigned READ-ONLY rights. This, of course, was my desired setting and should be set according to one's specific environment. Note that MyPersonalAccount has full READ-WRITE permissions to all of the resources being shared at SOURCE. 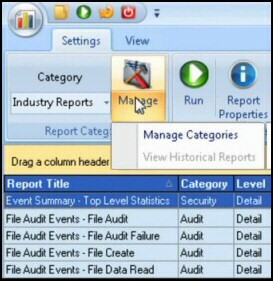 ** FULL CONTROL (this folder, subfolders and files): Administrators, System, MyPersonalAccount. ** READ-&-EXECUTE (this folder, subfolders and files): Spouse, Child. ** REMOVED "Authenticated Users", since I didn't want it to conflict with these user-specific settings. With these simple changes, resources are now shared as expected and I am no longer wasting time trying to unravel the mess that Microsoft's HomeGroup created in their effort to "simplify" sharing. If you are an old-timer with Workgroups, take the time to re-program your brain and synchronise with the Homegroup way of sharing. If you are new to computer sharing concentrate on the Homegroup password needed for the second machine. Troubleshooting Homegroup problems falls into three categories, Newbie errors, configuration mistakes and bizarre stuff. 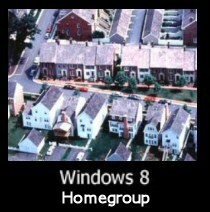 Homegroup is a new feature of Windows 8. You can clearly see how it has evolved from Workgroups; once you tune in to it’s ways and philosophy then you can see that Homegroup is a smart technology to share files on a small network. Windows 8 Homegroup is dedicated to connecting to printers and other users’ pictures, music and other files.